Letzte Änderung: 9 Monate 5 Tage her von l ptr. Do you also use the demo version? The difference between the left and the right screenshot of the initial mail of this topic will be the version and license. 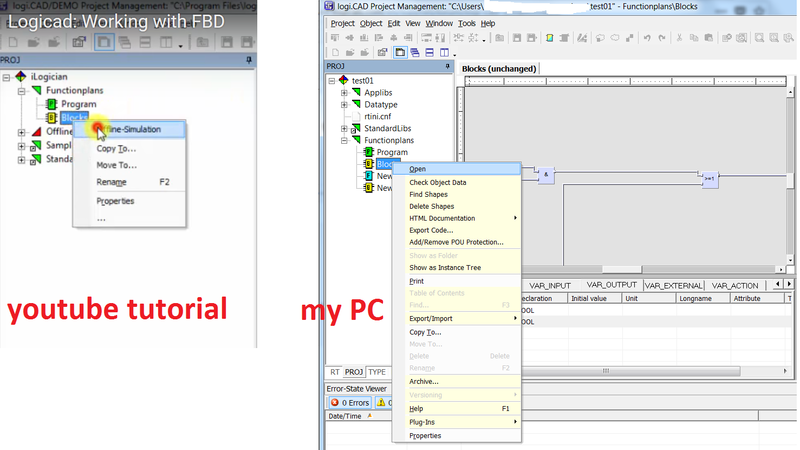 On the left side you see a "logi.CAD/DEMO" version (title bar) and on the right side logi.CAD runs with a license without "Offline simulation" enabled. Please give us the 8 digit serial number which is shown in this dialoge. Is there any other way to find out what kind of license I have, without disclosing the serial number itself? I have deliberately omitted to include the serial number in the screenshot, for security reasons. I try to avoid to post on a public form anything that could compromise the security of my company. I am sorry, but I just try to be precautious. With the informations known by me now I think, that it would be possible to install a "DEMO" version of logi.CAD in parallel on the computer on which the offline simulation is not working. Please note, that logi.CAD DEMO version has an incompatible data format compared to logi.CAD full version. That means: objects, which are saved within a logi.CAD DEMO version cannot be opened in a logi.CAD full version any more!